If there’s one PPC practice that should be instilled among all advertisers, it’s to make your brand stand out: not just physically or visually, but behind the scenes as well. Of course, advertisers want their brands to stand out above the rest, that is a given; but it’s important to keep this same methodology in place when compiling your PPC campaigns (and I’m not just talking about writing an eye-catching ad). Here’s an example: Imagine you work for an athletic shoe company. If a potential buyer searches “(Your Brand Here) women’s tennis shoes,” you don’t want your generic keyword “women’s tennis shoes” to battle with other brands’ generic keywords in order for your ad to appear. Sure, it’s possible that your generic keyword will trigger your ad as a result of this search, but chances are that any click captured in this way will be much more expensive than a click as a result of a branded keyword. You’re paying more for that click than you should have, and fighting for that click with more competitors than necessary; having brand keywords could have helped your ad show up in a better position while obtaining clicks at a lower price. PPC gurus know that to develop a successful structure for Paid Search campaigns and accounts overall, product and services should be grouped tightly, in order to ensure potential customers are seeing ads that are relevant to their search queries and landing on site pages that take them where they need (and want) to go. You’d be surprised, however, by how many advertisers group their brand keywords with generic non-brand keywords, assuming that as long as the campaigns and ad groups are specific enough, brand and non-brand keywords will work the same. Moreover, you’d be surprised at how many advertisers don’t bid on brand keywords at all! 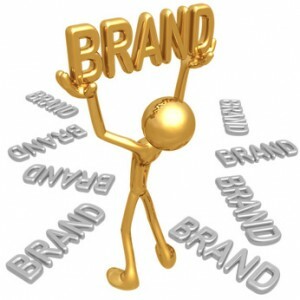 Always make sure you have brand keywords throughout your account… always! I have seen VERY few instances where not bidding on brand keywords has been the better choice for an advertiser. While the simple example above explains why it’s important to have branded keywords within your account, we still haven’t touched on why these terms should be separated. Just as any campaign in a PPC account is separated from another, brand and non-brand campaigns perform differently, and can therefore be managed differently. Let’s use another example from the same athletic shoe company: The keyword ‘women’s tennis shoes’ should not be found in the same ad group or the same campaign as the keyword ‘(Your Brand Here) women’s tennis shoes.’ The main reason for why we should do this is obvious: user intent is different, and therefore performance is different. When a user types a brand name into a search engine, whether or not it is long- or short-tail, that person already has that brand on his or her mind. Therefore, a campaign consisting of only brand terms will almost always have a higher click-through rate than generic campaigns, while also likely spending at a lower rate due to the lower price of the keywords themselves. As I touched on in a past blog post, click-through rate is the strongest factor in determining quality score, and having a strong quality score is key for PPC accounts. While you can’t see the direct effect of quality score instantly, the strong click-through rate of brand campaigns will earn you some extra brownie points with Google when it comes time to determine CPCs and ad rankings. Mixing brand and non-brand keywords in the same campaigns would not result in the strong click-through rates an all-brand campaign would see. In another blog post I also explained the value and importance of negative keywords, and brand vs. non-brand is a perfect example of such usage. By having brand and non-brand keywords separated, you can ensure branded searches are never triggered by generic (and remember, more expensive!) keywords by setting your brand name as a negative throughout your generic campaigns/ad groups. This will help keep your costs stabilized and also ensure that the best ads are showing up for the right searches. Split your branded keywords into appropriately relevant campaigns and ad groups just as you would non-brand campaigns. Once this is complete, I recommend giving these brand keywords strong max CPCs to ensure they appear in top rankings. Also be sure that the ads contain your brand name itself in the headline, so that potential customers see right away that you are the company they are looking for. Thanks to Google’s automated rules tool, you can set a rule to run for these campaigns that will ensure these keywords remain above a certain average position, specified by the advertiser. I recommend setting a rule to keep the average position of keywords somewhere between 1.5 and 1.3, but this should be set based on what you know works for your keywords (and this can be changed at any point in time). 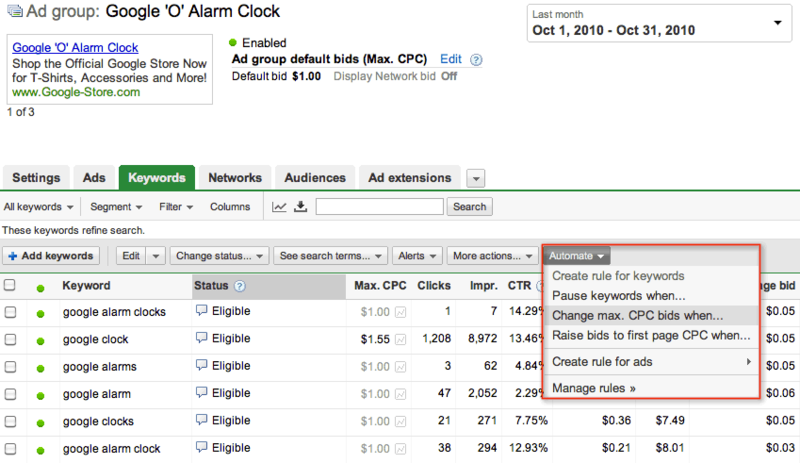 When a keyword drops below the set position, Google will increase the max CPC by the amount of the advertiser’s choice, and will discontinue any bid increases when it reaches the maximum CPC you indicate (if you so choose). These changes can be made based on the time interval of data you choose, but I usually set the rule to run based on data from the previous day, and to run everyday around noon or 1pm. I highly recommend the use of this tool – there are many different ways to set automated rules and they can be updated or discontinued at any time. Setting up separate brand campaigns will help you efficiently capture additional conversions at a lower cost, while allowing you to separately manage your more expensive generic keywords with results that won’t negatively affect the results of your brand keywords.